As a homeowner, you know all too well that your gas furnace can have problems that sneak up on you at the most inopportune time. From unexpected furnace repairs to a mishap with the thermostat, these furnace fails can give you quite the headache. But while furnace fails can ruin your weekend, there are also furnace wins like DIY furnace maintenance that can save you heaps of money or prevent downtime. To help you avoid common fails and experience more wins, we created popular furnace fails and wins using our favorite memes. Feel free to save and share them with your family and friends the next time your furnace does something worth talking about. 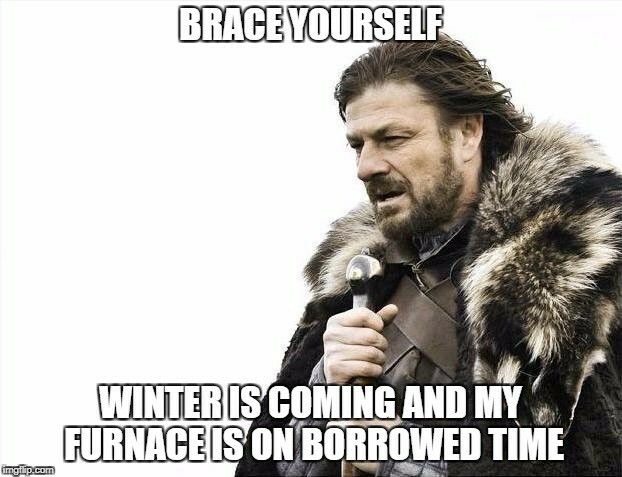 Without further ado, here are six furnace fails and wins any homeowner can relate to as told by popular memes. It’s likely happened to all of us before. 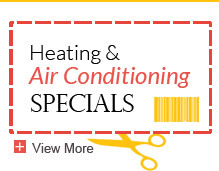 We have company in town, the temperatures plummet, or the holidays are approaching and your furnace unexpectedly shuts off. Why? You have no idea. 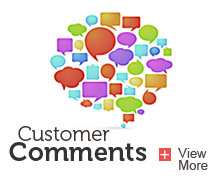 Even after troubleshooting your furnace, you finally deem that you need professional help. No one likes to make that call. And having it happen at the worst time makes it all the more difficult to deal with. Depending on your home’s furnace efficiency, you could be going into your furnace room to change the air filter quite often over the winter season. Especially if your furnace is emitting smells like burning dust, you’ll want to replace your furnace filter right away. But with no instructions provided on the furnace or the filter itself, it can be a head scratcher to know when to check it or how to replace it. 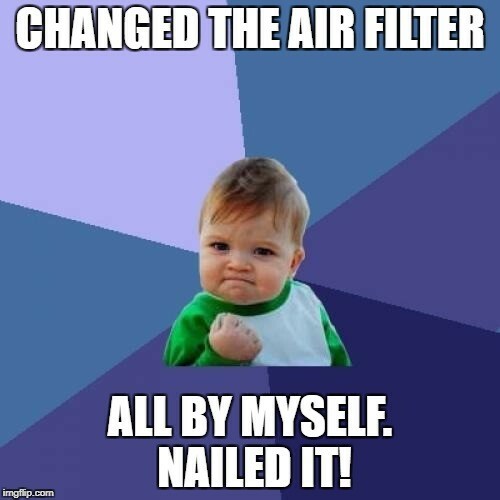 That makes every time you can change the filter on your own without needing to get on Google or phone a friend a personal victory. Older furnaces simply have a hard time keeping up with the cooler temperatures. After years of prolonged or continued use, furnaces and their parts can start to deteriorate due to the extreme heat they have endured for years. If your furnace is on the older side (we’re talking over 15 years or so), you know that any upcoming winter could be a hard one that may mean the end of your furnace’s life. Luckily, there are ways to tell when you need a furnace replacement and when you just might need some extra maintenance. When your furnace starts acting up by shutting off too frequently or struggling to maintain a constant temperature, it’s hard to know what the real cause is. And if the problem persists, you can become even more skeptical of your furnace’s overall health. 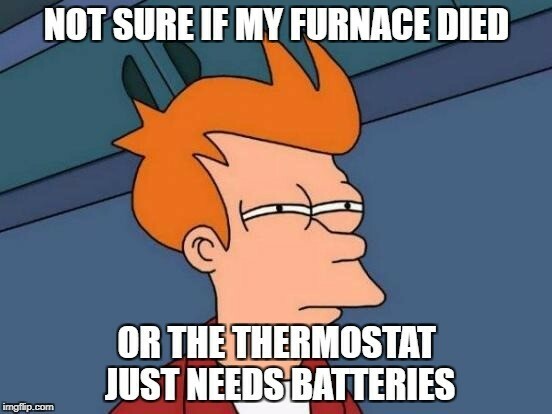 It’s not a fun feeling thinking that your furnace might be busted. If you can relate to this furnace fail, you already know that the next step is to do get your hands dirty and take a look yourself. But before you go too far, here are things you need to consider before repairing your furnace to avoid further damage or costs. 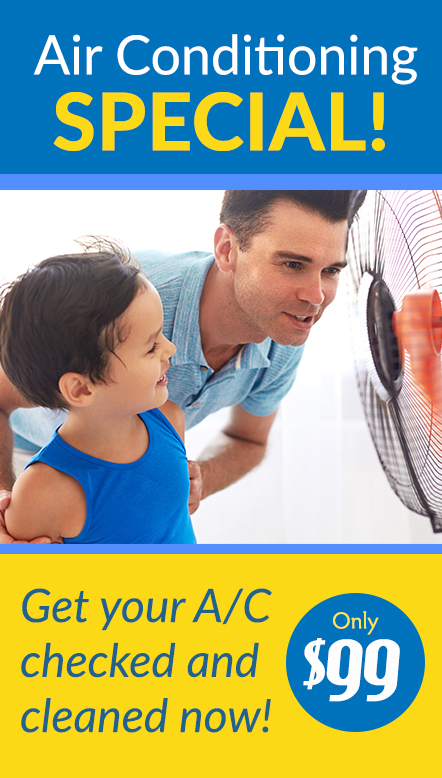 Picture this: Your furnace needs a costly repair, but luckily it’s covered by warranty. 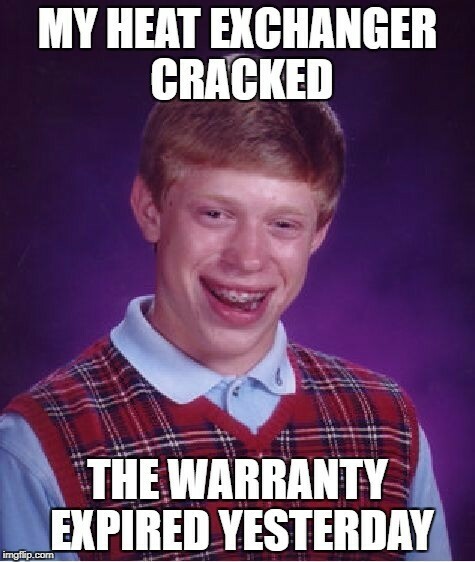 Except that when the technician arrives, they inform you that your warranty has actually expired. Bad Luck Brian indeed. It’s rare, but it does happen. Even if this has never happened to your furnace, you may have had it happen with your car or another warrantied product in your home. 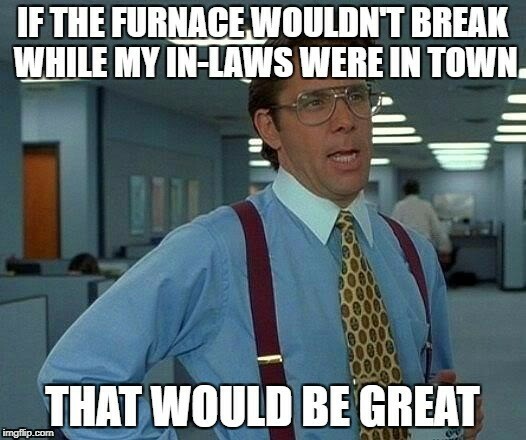 If you’ve had something similar happen to you, the best way to ensure the longevity of your furnace (an avoid being Bad Luck Brian) is to schedule annual furnace maintenance to keep your heating system in great shape. 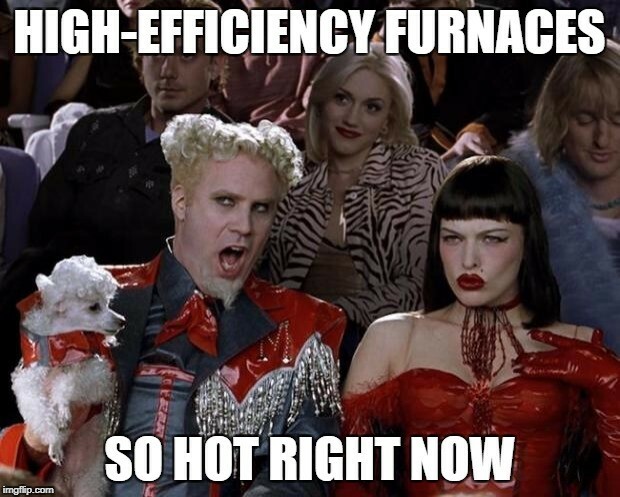 Once you do reach the point of needing a new furnace, or you’ve needed a new one in the past, it will become clear to you that high-efficiency furnaces are everywhere. A great way to save money on heating bills, high-efficiency furnaces waste less heat and energy when heating your home. For example, Trane 95 gas furnaces only waste 3.6% of the heat they produce, whereas older furnaces waste 20-40% of the heat they put out. Knowing this, there’s a reason why efficiency is a hot topic. Your best shot at preventing the above furnace fails and accomplishing the big wins is to perform regular perform regular maintenance and keep a vigilant eye out for potential issues. 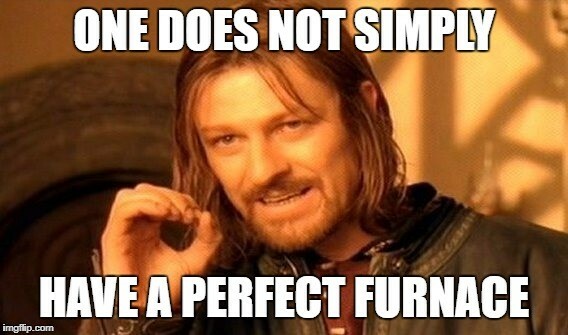 And if you’re furnace starts to give you a hard time, you can certainly vent your frustration using the above memes. Of course, we’re happy to help, too. If you have questions or concerns about your furnace, get in touch with us.